This still from a NASA video depicts the Mars Phoenix Lander during its cruise to the red planet. PASADENA, Calif. — It?sgoing to be a nice day on Mars when NASA?s Phoenix Mars Lander makes its plannedtouchdown in the northern plains of the red planet on Sunday, mission engineerssaid Thursday. ?The weather is goodfor our landing on Sunday, no dust,? said Phoenix principal investigator PeterSmith of the University of Arizona. ?We are ready to explore the northernplains of Mars.? Now in the homestretchof its 422million-mile (679 million-km) trek to Mars, Phoenix is just 77 hours awayfrom its May 25 landing, mission managers said during a briefing here at NASA?sJet Propulsion Laboratory (JPL). Phoenix is slated toland on the artic plains of the Vastitas Borealis region of Mars, where it willdig down into the rock-hard layers of water ice thought to lie under theMartian soil near the planet?s north pole. Mission scientists hadbeen monitoring a dust storm in the vicinity of Phoenix?s planned landing site,but determined it won?t pose a problem during the craft?s descent throughthe Martian atmosphere, Smith said. The $420-millionmission launched in August with some of the same instruments originallydesigned for its ill-fated predecessor, the Mars Polar Lander that crashed in1999, and is aimed at testingthe Martian soil and ice to see if it could have created a habitable zonefor primitive life at some point in the past. The probe carries a shovel-tippedrobotic arm, ovens and a wet chemistry lab to study Mars ice samples. Mission scientists hopeto receive the signal that Phoenix has landed on Sunday at 7:53 p.m. EDT (2353GMT) - there will be about a 15-minute delay between landing and when thesignal reaches Earth because it must travel the 171 million miles (275 millionkm) between the two planets. But before Phoenix canbegin its science mission, ?it has to go through one of the most risky phasesof its landing, the entry descent and landing,? said Fuk Li, NASA?s MarsExploration Program manager at JPL. ?It will be a nerve-wracking time on Sundayfor all of us.? While missionscientists are optimistic about Sunday?splanned landing, they acknowledge that there is no guarantee of success.Mission engineers are hoping they?ve worked out all the problems that wereencountered with the lost Mars Polar Lander (MPL) in 1999, which used a similarlanding system to Phoenix, but failed during descent through the Martianatmosphere. Mission scientists saythe craft has performed fine so far with all course adjustments and in-flighttesting, even skipping one trajectory correction since it?s been flying sotrue. ?We?ve had a veryclean flight to Mars so far,? said Ed Sedivy, Phoenix spacecraft manager fromLockheed Martin Space Systems. ?The spacecraft has been very well-behaved.? 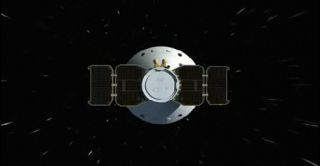 Phoenix?s nextpossible maneuver will come on Saturday at 10:46 p.m. EDT (0246 May 25 GMT)with an opportunity to adjust the adjust the craft?s course toward the Martianarctic by firing its thrusters. If all goes accordingto plan, Phoenix will land somewhere in an elliptical area at 68 degrees northlatitude, 233 degrees east longitude. To make successfullanding, the spacecraft will have to endure a harrowingseven-minute descent through the Martian atmosphere, which Li and the othermission scientists described as the most difficult part of the whole mission. Friction at thebeginning of its fall will heat the craft?s heat shield to a scorching 2,600degrees Fahrenheit (1,420 degrees Celsius). Phoenix?s parachute should deploy oncethe probe is at an altitude of about 7.8 miles (12.6 kilometers) above theMartian surface. During the next three minutes of the fall, the heat shieldwill be jettisoned and the legs will extend. Thrusters should kick in whentouchdown is just 40 seconds away to slow the lander into its planned softlanding. The last successfullandings on Mars were NASA?s two Mars Exploration Rovers Spirit and Opportunity,but those craft used airbags to cushion their landing, not thrusters. Thethruster technique that Phoenix will use has not been used successfully since NASA?stwo Viking missions set down in 1976. NASA scientists hopethat Phoenix will follow the successes of the two rovers and other successfulmissions. If all goes well, ?on Sunday, we?ll be welcoming to this family a newfamily member, the Phoenix Mars Lander,? Li said. NASA's broadcast PhoenixMars Lander events live on NASA TV, with the next mission briefing set for 3:00p.m. EDT (1900 GMT) on Saturday, May 24. Clickhere for SPACE.com's Phoenix mission coverage and a linkto NASA TV.